The QUEUE pane with a few models loaded. The QUEUE is the stored list of models to be printed in a certain order. It is shown when the program starts. If not the currently displayed pane, it can be accessed by clicking the button on the Main Screen. The number in parentheses next to the button indicates the number of models currently loaded in the QUEUE. In the example to the right, the QUEUE has 28 models. The QUEUE has two sets of buttons: the upper set, which perform actions on selected models, and the lower set, which perform other functions. Shows a check box next to each model so one or multiple models can be selected. 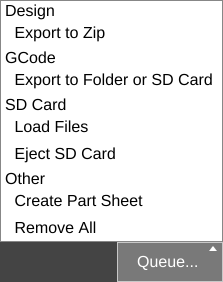 Opens the File export options dialog box to export the currently selected file. Active when only one file is selected. Makes a copy of the selected model. Deletes the selected file(s) from the QUEUE. Shows a drop down menu of additional file action items. Opens the Send to Remote Device window, allowing the user to send the model to another device signed in under the same MatterHackers.com account. 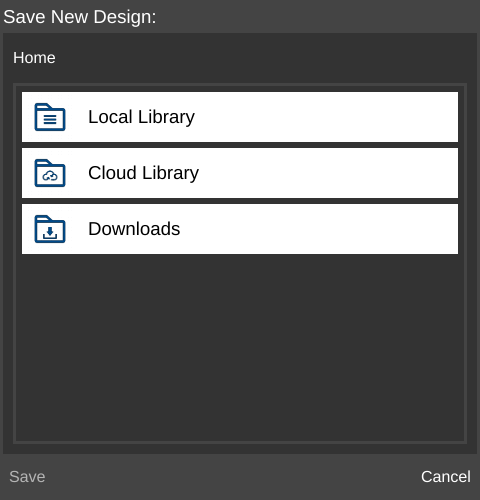 Opens the Save New Design window, allowing the user to save a copy of the model in a valid section of the Library. Opens the operating system's file selection window so the user can choose a .STL, .AMF, .GCODE, or .ZIP file to add to the QUEUE. 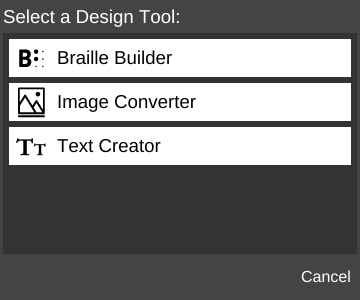 Opens Select a Design Tool window, which has links to the available Design Tools. Opens http://www.matterhackers.com/store/3d-printer-filament in the system's default web browser. Displays a menu with action items which affect the entire QUEUE. Opens the operating system's file save dialog box so the user can save a .zip file containing the selected file(s). Slices each model with the current slice settings and exports the .gcode files to a specified folder. 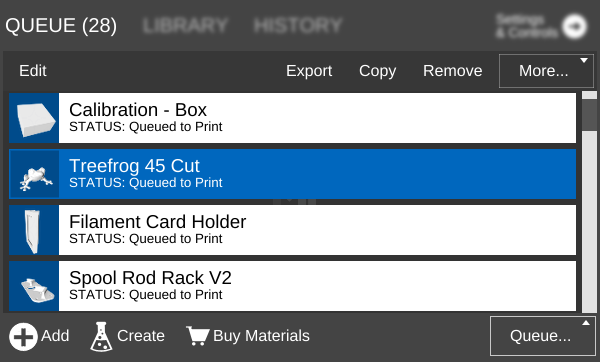 Loads into the QUEUE any files from an SD card currently inserted in a connected printer while a print is not active or is paused. Release an SD card currently inserted into a connected printer. Creates a PDF file which displays a silhouette of each model in the QUEUE. Useful for keeping track of which models have been printed for large projects where many different models are needed. Deletes all models from the QUEUE, except for the currently printing model (if applicable). This action is not reversible. This page was last modified on 17 November 2016, at 15:34.